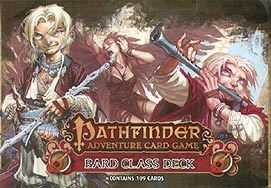 Bring your troubadour to any tavern with the Pathfinder Adventure Card Game Bard Deck. Explore four different Bard characters in this 109-card set, from Lem the magic researcher to Siwar the information broker. The bard Deck features diverse new allies, weapons, spells, and other loot to take your character all the way through any Pathfinder Adventure Card Game Base Set, or Pathfinder Society Adventure Guild Organized play campaign!